AND THANKS FOR YOUR INPUT. If you have reduced the string penetration to 15 mm, which I can understand, then the thickness of the string does not need to be 50 mm (I did this to allow for 30 mm penetration), but instead can be reduced to 40 mm. Smoothing out the edges seems like a great idea. The extension of the string in front of the first step was done on purpose and is owed to the general layout of the room. The bit of extra wood is fine. So once you do the mod of the string thickness, I’m good with receiving the manufacturing files. Here are your working files. 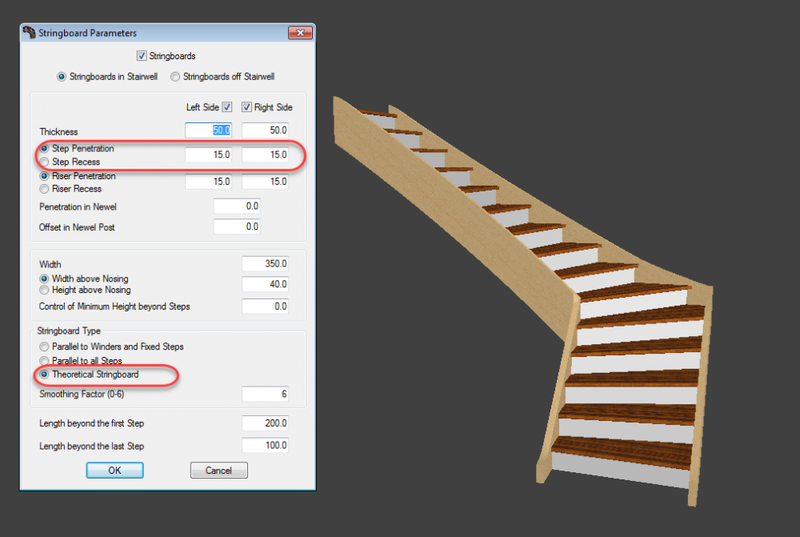 Please note that, StairDesigner by default draws the string assembles as mitred but I really don’t suggest you join the strings like this. The mitre joint drawn leaves enough “extra” wood to draw the type of joint that suits best your project. However the joints between the left strings as well as their shape may have to be modified according to the way you want to assemble them. Don’t hesitate to ask if you need help with this. Check carefully these drawing before manufacturing. Thanks for buying a StairFile and posting your project. You stair looks great and I haven’t seen anything basically wrong with the design. – made the step to string penetration 15 instead of 30, this will make it easier to cut the housings. I see that you have also extended the string in front of the first step by 200mm is this done on purpose ? In most cases to save wood, the strings are extended only 10 to 30mm to cover the step housing. Can you check the design and if it’s OK I’ll send the manufacturing files. By the way compliments for your software, it really works well, once you have mastered the tools and the way it works. Great time saver: I also bought a book, but I could not find the right information for the type of stairs I needed.